Independent downloadable desktop software from Hexner Limited. Make your service stand out from the rest. The Sage 50 users we spoke to wanted a faster, more flexible, system for producing Management Accounts reports from Sage 50 data. ProudNumbers has been developed specifically to produce a complete, professional report, in minutes, from Sage 50 data. 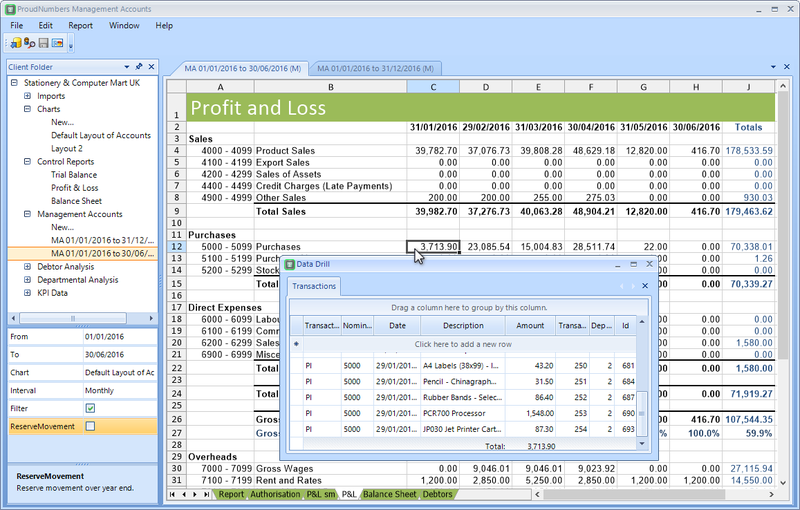 Transactions Inspector allows you to analyze data behind figures in your reports. Thus you can provide valuable guidance to your client understanding the dynamics in the underlying business. But more than that it also gives you the tools to add value to your reports. By allowing you to create bespoke Charts of Accounts and the freedom to choose the reporting period from weeks to years you can create a truly individual analysis. ProudNumbers works on data imported from Sage 50. It puts the data into an SQL database, freeing it up for more flexible reporting and providing the facility to data drill. The database handling is fast, accurate and efficient. Each subsequent import is checked against the data existing on the database for updates and mismatches at the point of import. This way you are aware of any discrepancies before you start working. Both as an Accountant and Business Manager you are likely to have more than one set of data to manage. ProudNumbers handles multiple sets of company data, all saved by you under the individual company name. ProudNumbers produces tables and reports including the Profit and Loss Account, Debtors and general KPI analysis. The user interface is uncluttered and uncomplicated. If you are an Accountant you instantly add value to your clients data for less work. If you are a Business Manager you can save money by regular tracking of accounts internally. This is an easy to use software and a fantastic add-on to Sage 50, accountants using this software for customers need to take notice! The Import Wizard will guide you through generating a Management Accounts Report from a Chart of Accounts imported with Sage. Once the Charts are imported from Sage you can customise them to your needs and generate the required report. Have the time to give your customer more understanding into the figures that affect their business. ProudNumbers is independent management accounting software developed in the UK by Hexner Limited.